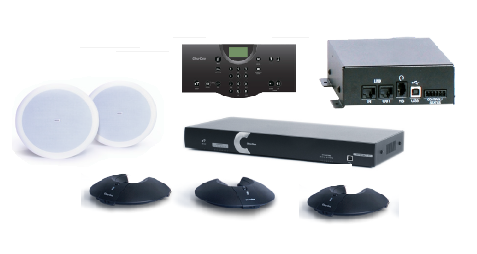 This Clear One INTERACT AT Conferencing System package includes the INTERACT AT system, three INTERACT MIC pods, a wireless controller, a wireless receiver, and a ceiling mount speaker system. The Clear One INTERACT AT mixer included in the bundle provides advanced audio processing for superior sound quality. With the INTERACT AT mixer, mix & match up to (3) Mic Peripherals with CAT5 cable. The mixer includes an analog telephone hybrid and 5W built-in amplifier. The bundle's Clear One INTERACT Mic is a microphone pod for the INTERACT AT conferencing system. Each pod features three voice-activated mic elements for 360° audio pickup. Clear One’s INTERACT Dialer-W is the wireless controller included in the bundle which provides an intuitive interface that emulates a telephone keypad. Its functions include dialing, volume control, and mute control.Clear One's Wireless INTERACT COM-W acts as the wireless receiver when using the Interact Dialer-W. The device provides interfaces for USB audio and Headset audio. Clear One’s INTERACT AT is a complete conference room solution that delivers exceptional audio quality with its various accessories and features.